With financial support from the Fusion Investment Fund, the European Public Relations History Network (EPRHN) held its first planning meeting at BU on Wednesday June 26. The network was founded virtually in 2012 by Prof Tom Watson of the Media School and drew interest from 33 academics and practitioners in 11 European countries. 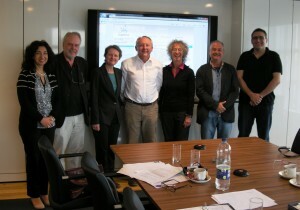 It was approved.as a project by EUPRERA (Europe’s PR education and research association) in autumn last year. Its aims are to develop and produce information about the history and historiography of public relations in Europe through the identification and formation of archives, transnational research, joint research bids and the production of publications in print and online formats. The meeting of EPRHN’s core group brought seven historical researchers from Germany, Romania, Spain, Scotland, Turkey and Bournemouth. Fusion assisted their attendance through travel bursaries. Among the actions to be progressed are a bid to the EU’s COST (Cooperation in Science and Technology) scheme, which was facilitated on Wednesday by Paul Lynch of RKE; a second edition of its Archives Record publication; and a panel session on ‘developing the history of European public relations’ at EUPRERA’s annual conference in October. Prof Watson, who was supported by Dr Tasos Theofilou in the organisation of the meeting, said it had been highly productive. “There’s a limit to what we can achieve by email and Skype. The EPRHN made a big forward step because FIF helped bring key members together”. It will also assist Prof Watson and Dr Theofilou to fully launch the group at the October conference. “At present, 13 countries are represented in the network. We hope to widen that base and engage many more historical researchers in its activities”, said Prof Watson. For more information about EPRHN and BU’s contribution to the burgeoning field of PR history, go to: http://historyofpr.com.